An online timeline can be useful as a way to highlight your collections based on events you put on the timeline; to help you organize and process a collection; to feature your state’s/university’s/county’s/organization’s history online where younger audiences will find it and, one can hope, “follow” it; to trace the history of a person or family through time; to use as part of an exhibit; to create a timeline to go with a class syllabus; or to “collect” new Internet postings as they appear based on search terms you select. Dipity is one example of an online timeline creation tool or generator. It has been around for a (relatively) long time. Many newer ones have come along, building on Dipity’s success. As with all Web 2.0 tools, you need to keep an eye open for the latest innovations. For this Thing, we are looking at “Minnesota History” on Dipity, an example of both a timeline of the state’s history and a timeline that highlights collections, in this case of the Minnesota Historical Society (MnHS). The most recent events on the timeline are too new to have items in the collections already, so look at some of the older events on the timeline. The “I-35W Bridge Collapses” event (Aug. 1, 2007) includes a podcast video created by the archives staff, as well as links to resources on the bridge and a blog posting on a museum item. Then go back to Jan. 4, 1999, “Ventura Becomes Governor.” This event includes links to the Society’s “Governors of Minnesota” webpage, photographs of Jesse Ventura in the the Society’s Photo and Art Database, and you can even listen to Governor Ventura’s speeches, which are available online. Other entries have links to online catalog records, EAD inventories, and “Minnesota History Topics” for History Day students. 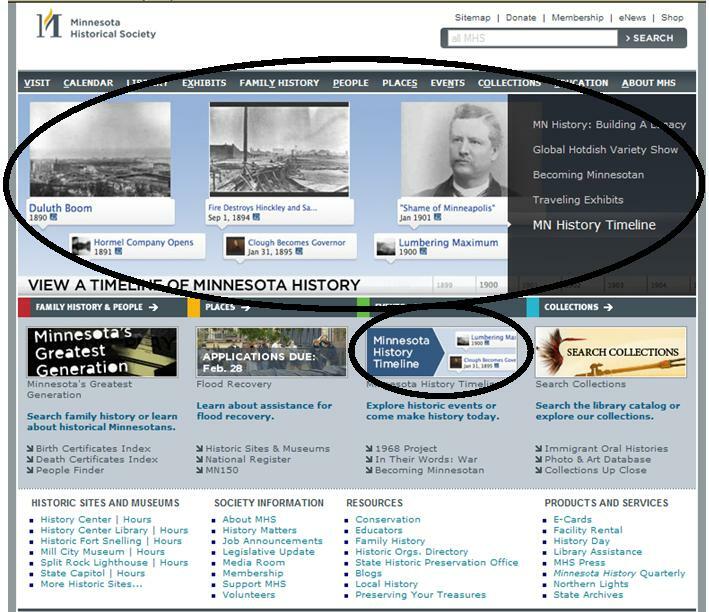 In February 2011, MnHS was featuring the timeline on its main homepage in one of the four boxes across the middle, but also as one of the changing items in the “hero.” Now it is back to being just one of the four boxes (lower circled item). Besides having your timeline “in the cloud” on Dipity itself, their timelines can be embedded on your website. The Minnesota History timeline is also located on the Minnesota Historical Society’s website. “Minnesota Biographies,” an attempt to pull out all of the births and deaths of the famous, infamous, influential, and important figures in Minnesota history that were cluttering up the main Minnesota History timeline. It has not seen the number of views that the main timeline has, but it is also not featured on the Society’s website. The Bicentennial of Abraham Lincoln’s Birth was celebrated across the country. Minnesota created a Dipity timeline to showcase Lincoln’s impact on the state. It is a small, focused timeline for a very specific topic. Move the +/- tool to see more of the events, or click on the + icons at the bottom of the timeline. “Minnesota’s Greatest Generation: The Depression, The War, The Boom” is a timeline showcasing events from 1929 to 1959 that shaped Minnesota’s Greatest Generation and goes with a major exhibit at the Minnesota History Center on the same topic. Many of these events also link back to collections in the Society’s archives. Set up a timeline in Dipity (or another generator if you prefer) and add some events. Link back to some resources on your own website. Brainstorm about ways you might use a timeline for your archives. Blog about the timeline you set up – was it easy or difficult, did you make some links back to your archives’ website? If you explored some of the other online timeline makers, which ones did you like and why, and which ones didn’t you like and why. There aren’t a lot of online timelines created by archives yet. Here are some timelines created by others that you can explore. These are not recommendations, just different things to look at. If you find some good timelines, let us know! At the Nationaal Archief, the National Archives of the Netherlands, we’ve created a timeline for our website ‘Farewell to the Indies’. The website is a digital source where you can consult Dutch and foreign documents about the Japanese occupation, the Bersiap Period and the decolonization of the Netherlands East Indies. The timeline is meant to provide some context to help interpret the documents. See http://www.en.afscheidvanindie.nl/geschiedenis-tijdbalk.aspx. Thanks for the link – we have added it to the examples on Thing 19. Did you use an online time line builder, or build it yourselves?